Celebrate Tooting High Street: A new soundscape is coming to wake up the streets! Sing and dance your way around Tooting High Street this July! 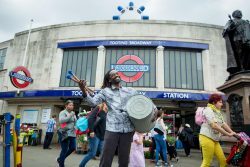 This July Tooting will be bursting with music, song and dancing as The Streets returns to the high street with a weekend full of performances, workshops and parades. The Streets aims to reignite the full potential of the high street, aligning cultural activity with commercial priorities. By animating local streets, residents and visitors have the chance to see and take part in something new and exciting, using their communal space as its stage. Acclaimed live music and event producer, Serious, has been working in partnership with Enable’s Arts Team and Tooting Town Centre to bring the high street to life with music focused programme including events and performances from established artists alongside community choirs, street performers and local musicians. Saturday 23 July is Choir Clock with performances on the hour from 10am to 8pm across the high street. These include home grown talent, beatboxers Maverick + Malachi, The Great Gustos and World Heartbeat Music Academy, alongside acts like the House Gospel Choir, The Spinettes and London Vocal Project. Family singing workshops are at Tooting Library. The Streets is an ambitious and dynamic programme which will bring high quality music and performance to high streets across seven outer-London boroughs in 2015 and 2016. Designed to showcase the local streetscape and unlock the potential of high streets, local residents, businesses and visitors will be encouraged to rediscover and reclaim their public space. Acclaimed live music and event producer Serious is working with a consortium of seven boroughs – Waltham Forest, Redbridge, Greenwich, Croydon, Wandsworth, Richmond upon Thames and Kingston upon Thames – to tour an artistic programme of music and performance around London, using the communal space of the high street as its stage. Enable Leisure & Culture, delivering services on behalf of Wandsworth Council.